Initializing Pointers: What's Under the Hood? Ownership: When do we grab() and release()? In UNIGINE instances of C++ API classes (such as: Node, Mesh, Body, Image and so on...) only store pointers to instances of internal C++ classes, they cannot be created and deleted via the standard new / delete operators. So they should be declared as smart pointers (Unigine::Ptr) that allow you to automatically manage their lifetime. UNIGINE has its own optimized memory allocator for faster and more efficient memory management. Each smart pointer stores a reference counter, i.e. how many smart pointers are pointing to the managed object; when the last smart pointer is destroyed, the counter goes to 0, and the managed object is then automatically deleted. Not all methods of Engine's internal C++ classes are exposed to the user, some of them are used by the Engine only. These are specific functions that either are used only for some internal purposes, or cannot be given to the user "as is". So, to filter out such methods an intermediate level, called interface, is used. This interface stores a pointer to the instance of the Engine's internal C++ class, a set of wrapper-methods and a set of ownership management methods. To create an instance of an internal class we should declare a smart pointer for it and call the create() method - class constructor - providing construction parameters if necessary. When declaring a smart pointer you should remember about its scope, e.g. when you declare a smart pointer inside a function, its scope is limited by this function. Thus, the created instance of the internal C++ class will be deleted upon leaving the scope. You should avoid cyclic references! If there is a ring, or cycle, of objects that have smart pointers to each other, they keep each other "alive" - they won't get deleted even if no other objects in the universe are pointing to them from "outside" of the ring. 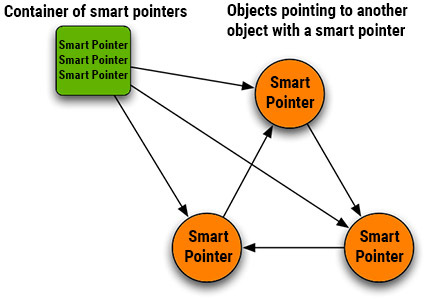 This cycle problem is illustrated in the diagram below that shows a container of smart pointers pointing to three objects each of which also point to another object with a smart pointer and form a ring. If we empty the container of smart pointers, the three objects won't get deleted, because each of them still has a smart pointer pointing to them. For more information on ownership management, see Memory Management page. For more information on managing smart pointers, see Ptr class page. A NodeDummy node itself (internal). Its implementation is hidden from the user. It is this user interface that has grab(), release(), isOwner() methods. If an interface is created via the static function create(), after its creation isOwner() == 1 (this means that when you delete this interface, Engine's internal object will also be deleted along with it). In all other cases (e.g. World::get()->loadNode()), isOwner() == 0. A NodeDummyPtr smart pointer, which stores a pointer to the NodeDummyInterface which in turn points to the Engine's internal NodeDummy. It has a pointer and a counter and behaves just like an ordinary smart pointer. the counter will be set to 2, and NodeDummyInterface shall not be deleted until both these NodeDummyPtr's (dummy and dummy2) call their destructors. NodeInterface pointing to the internal NodeDummy object. For this interface isOwner() == 0. So should we delete it, the internal object shall not be deleted with it. NodePtr pointing to the NodeInterface. we also get a NodeInterface with isOwner() == 0. Such node is monitored by the Engine. The same is true when we use World::get()->getNode(). Sometimes (e.g. when we use Editor::getNode(), World::getNode(), etc. ) we get a NodePtr value, which is a pointer to the base class, but in order to perform operations with certain object (e.g. ObjectMeshDynamicPtr) we need to perform downcasting (i.e. convert from a pointer-to-base to a pointer-to-derived). Sometimes you may also need to perform upcasting (i.e. convert from a pointer-to-derived to a pointer-to-base), in this case you can use corresponding methods of the derived class. Implicit type conversion for Unigine smart pointers is not allowed. The code samples below demonstrate the points described above. destroy() deletes the object immediately. When isOwner() == 1, both interface and internal class instance are deleted, otherwise only the interface instance is deleted. clear() deletes the object only in case if the smart pointer calling this method is the last one pointing to the object (interface, in this case). This should be taken into account. There is one thing about the destroy() method, that you should be aware of: you can load a large hierarchy of objects via World::get()->loadNode(), but when you delete a smart pointer of the root node of the hierarchy (e.g. by calling the destroy() method), only the node pointed by the interface will be deleted. All its children will become orphans and will remain in the world. In case of a NodeReference things are simple: as you delete it, the whole its hierachy is deleted as well, so there's nothing to worry about. In all other cases we'll have to delete all children recursively. Therefore, at run time it is recommended either to create NodeReferences or single nodes via the World's loadNode() method. Editor::get()->addNode() - now the Editor will own the object and manage it. Don't forget to call release() for all interfaces before adding nodes to the Editor. Editor::get()->releaseNode() - release Editor ownership. Now the object can be controlled by you - just call grab() and it's yours. Editor::get()->removeNode() - deletes the node. The best thing in this case is that when the Editor is the owner it deletes the node with all its hierarchy automatically. Generally, if you need to manage (create and delete) complex node hierarchies and change worlds, the best option might be to pass ownership to the Editor, after previously calling release() for all interfaces. In this case, when you change worlds, no orphan nodes will remain in memory, as the Editor deletes all nodes it owns on unloading a world. Then you can safely downcast a NodePtr to a NodeDummyPtr or upcast it back to a NodePtr without worrying about accidental or double deletion and without thinking about using release() / grab().